Having turned back from a walk to Coire an Lochain last week due to a possibility of thunderstorms (see post for June 9) I set off again and this time made into the corrie but almost didn't see anything due to the mist. 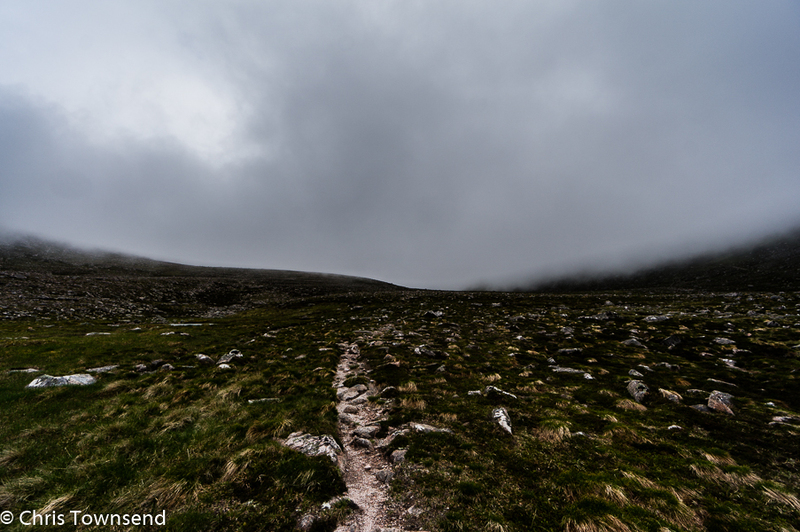 The forecast had suggested it might lift later in the day so I'd set off mid-afternoon watching the clouds rolling off the Cairngorm Plateau. 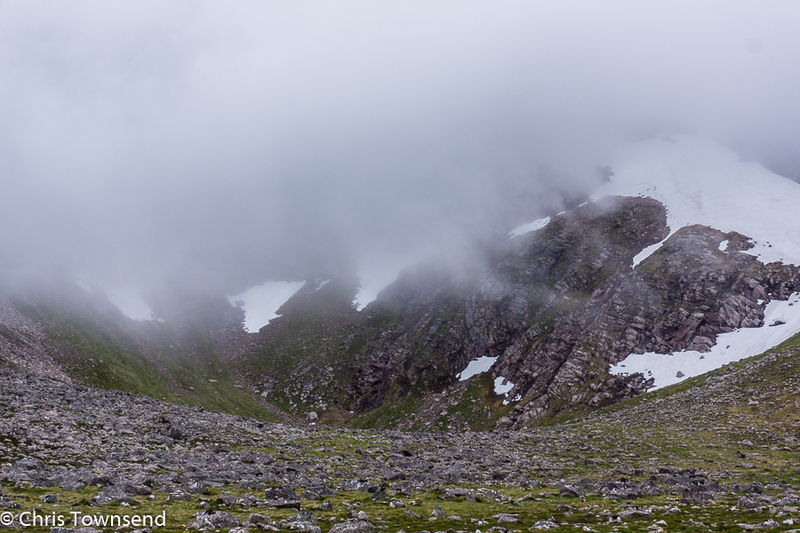 The cliffs of the corrie came and went, almost appearing out of the mist but then soon fading away again. As I wandered into the corrie I noticed a broken eggshell on the ground. 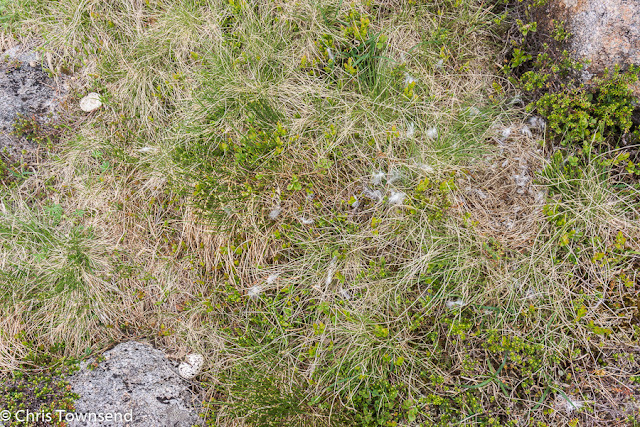 I spotted another and then a depression lined with dry grass plus a scattering of white downy feathers. 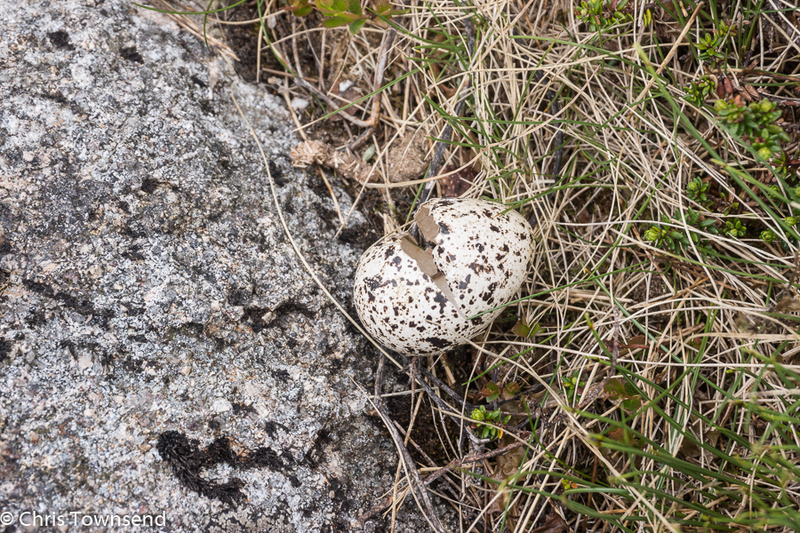 A ptarmigan's nest. I couldn't tell whether the eggs had been taken by a predator or had hatched. I didn't see any chicks but they were likely to be hiding amongst the stones. I did hear ptarmigan and saw one perched on a rock. The corrie itself was both sombre and bright. The grey crags faded upwards into grey mist. The waters of the two lochans were steel-grey and cold. But the fresh grass was green as was the moss on the boulders and brilliant yellow buttercups shone in damper spots. And the big snow patches glistened in the damp air. The corrie was noisy with the sound of rushing water, the sound of thin waterfalls crashing down the rocks from melting snowfields. Though not as extensive as in some years theree's still a fair bit of snow left despite the hot weather of the last few weeks. The wind was cold and the air damp. 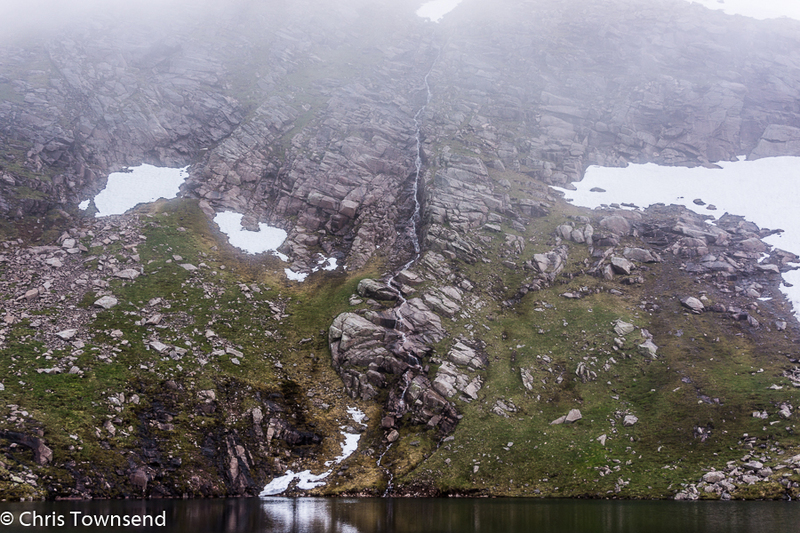 Soon the mist started to drift downwards. I turned to leave. This was far enough for today. I had no desire to wander in the mist. 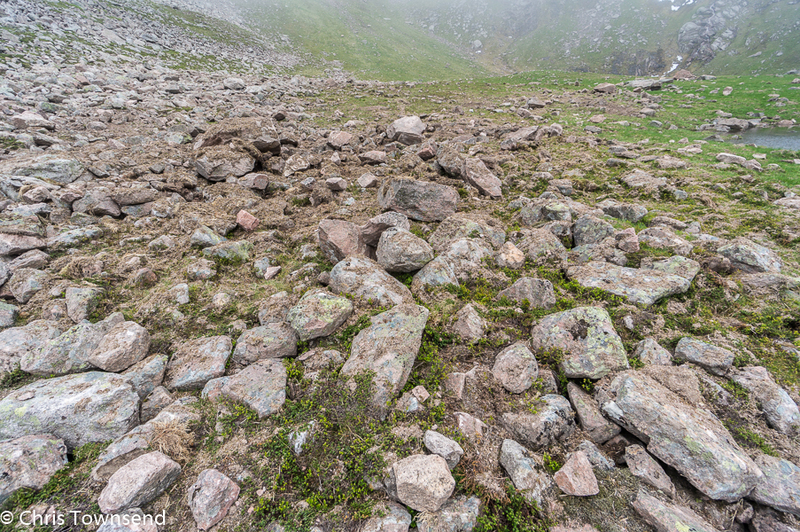 Below the crags and on the shores of the lochans I noticed much debris - dead vegetation and bare soil thrown on top of rocks and grass. 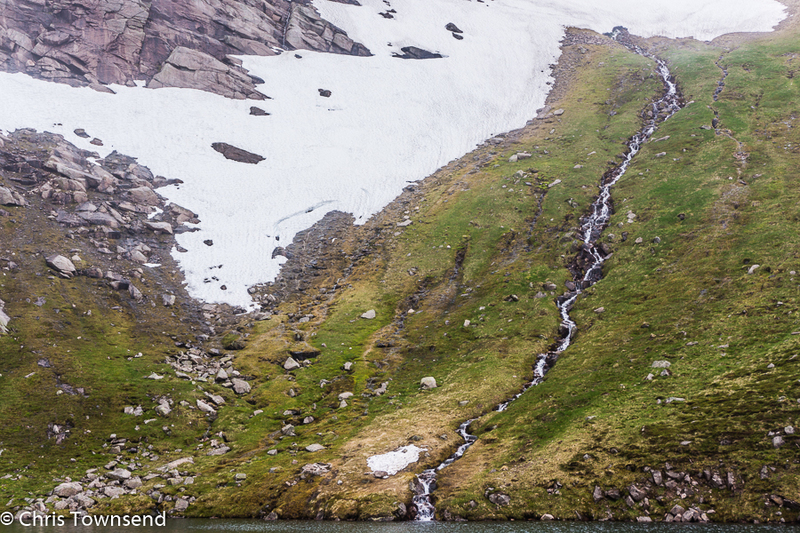 The aftermath of floods, snowmelt or avalanche? I couldn't tell. Maybe all three. I turned back for one last look at the corrie only to find it had vanished into the mist. 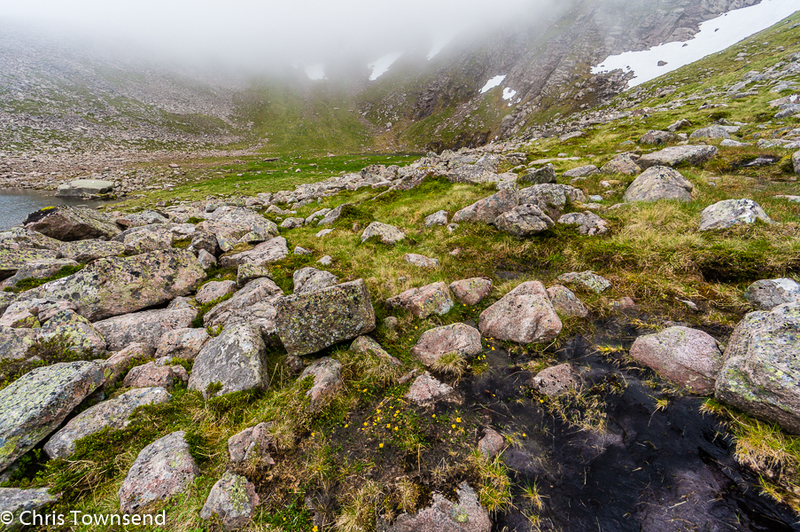 Crags, snow, lochans, buttercups, ptarmigan, all were gone.